Key task of the Department is the planning, execution and evaluation of the Austrian Forest Inventory. The large-scale inventory aims at providing information on the raw material wood and on the status of and changes in the forest ecosystem. The results of the forest inventory are used as a tool for decision-making in forest and environmental policy. They offer a valuable data source for a multitude of scientific projects. The Department hosts also the Austrian-wide Natural Forest Reserves Programme. With the generated know-how the Department contributes to a number of international networks and projects. At the European level, the Department provides leadership both in the fields of forest inventory and natural forest reserves. Ongoing development of methods for forest inventory: these comprise the adjustment of field surveys to new information needs in connection with biodiversity or Kyoto reporting. 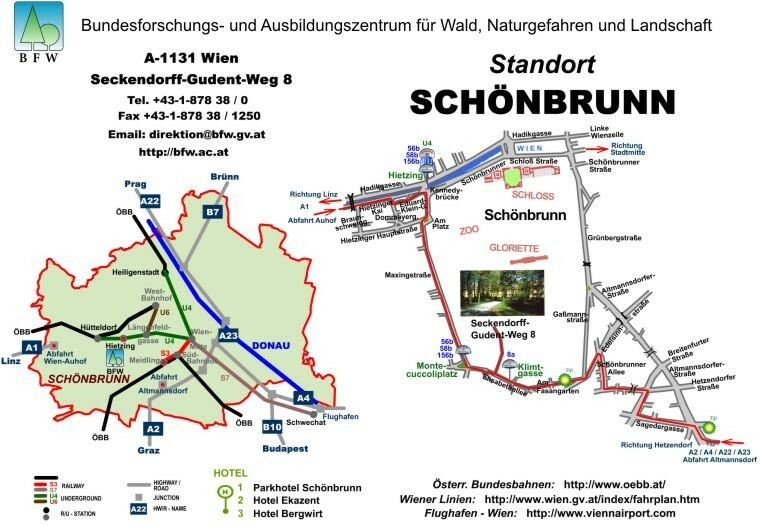 Logistical planning and execution of forest surveys in the forest: in addition to methodological aspects, an Austria-wide large-scale inventory is always a challenge in terms of logistics and database management. It needs modern technology both for measurement instruments (e.g. tree height measurement by means of ultrasound) and data entry and transmission. Interpretation and presentation of the results: the transformation of raw data into stakeholder information passes first the stages of data checking and statistical extrapolation, followed by user-friendly interpretation and presentation of results. The programme runs on the large-scale database of BFW. Use of remote sensing: aerial and satellite imagery for the collection of information on the forest has gained steadily in importance. These sources are increasingly used, together with the knowledge generated from terrestrial surveys. Thus, it is possible to get a bird’s eye view on and draw conclusions of every point of the forest. Further development and monitoring of the Natural Forest Reserves Programme. 11.01.07 | Schadauer, K.; Khorchidi, M.